Andy Hawking (Roland Key Board), Tony Abell (Bass), Keith Robinson (Alto. Sax. ), Dave Hignett (Tpt. Flugel. ), Niall Armstrong (Ten. Sax. Flute), Dave Francis (Drums). not have listened to this West Coast Modern Jazz style. respect and acceptance. Alter Ego will have successfully drawn attention to the place this jazz style has in the development of the music. See this band at their next gig. You will not be disappointed. I recommend Alter Ego to you. Cheese Cake, In Walked Horace, Coastal Breeze, Swinging Low, Karita, Nice and Easy, Little Man, Soulful Mr. Timmons, Hit and Run, All the Things You Are, Wheel Within a Wheel, Think of One, Zee Kay 30, Get Back in, A bittadose.... and more. AJC next meeting March 5th. 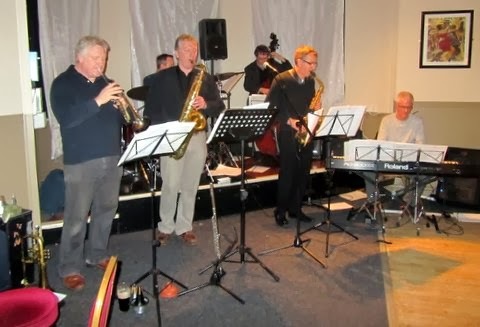 The Elephant at 8.00 p.m. Brian Carrick and His Band.